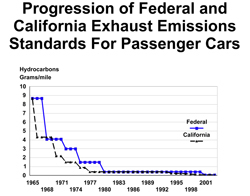 Over the course of the past 40 years, California has consistently led the way in adopting more stringent requirements for cars and light trucks which forced the development of new exhaust emission control technologies. 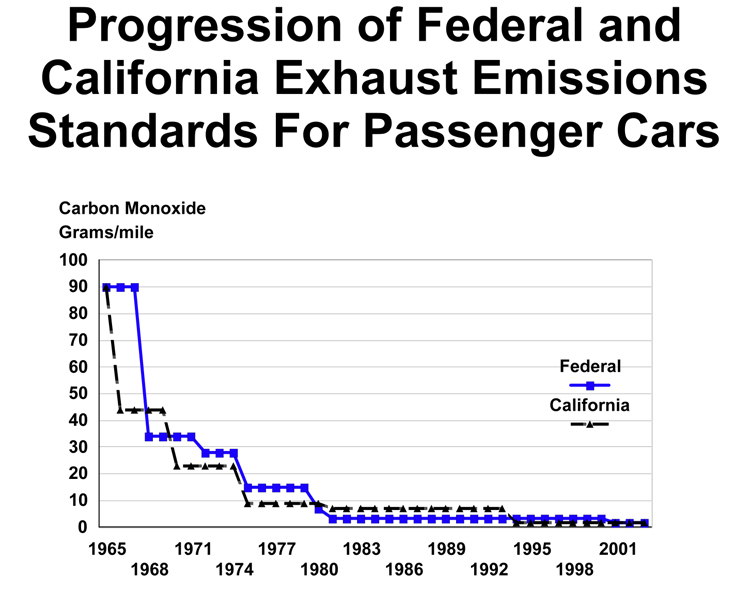 The Federal EPA has tended to follow California and eventually adopted very similar requirements. 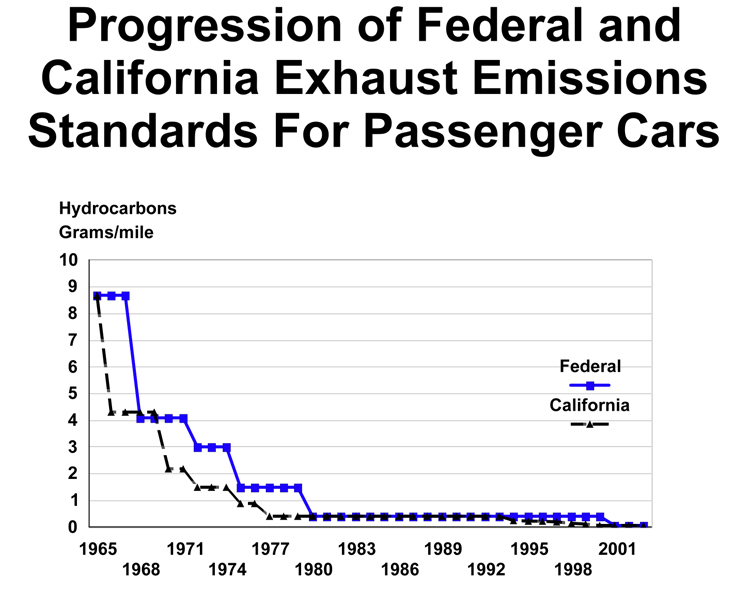 The evolution the California and Federal standards is illustrated in figures 8.2.2-1 and 8.2.2-2. The European Union adopted catalyst forcing standards for new petrol fuelled cars in the early 1990s (so called Euro I standards) and have gradually tightened them in several steps, Euro II in 1996, Euro III in 2000 and Euro IV in 2005. Similar requirements were adopted for diesel cars and light and heavy commercial vehicles. In conjunction with the tightening of vehicle standards, fuel quality improvements were also mandated. In some cases the fuels modifications are necessary to allow the introduction of vehicle technologies that are required to meet the new vehicle emissions standards. 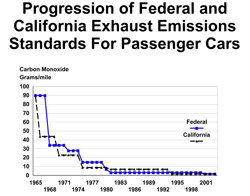 For example, the adoption of catalyst forcing standards such as US 1975 or Euro I standards for gasoline vehicles requires the use of unleaded gasoline. The adoption of Euro II standards for diesel vehicles will require the use of diesel with sulfur levels lower than 500 parts per million. Further reductions in sulfur levels in both gasoline (petrol) and diesel fuel are linked with US Tier 2 and 2007 Heavy Duty standards as well as Euro III, IV and, for diesel trucks, Euro V standards. In setting standards for new vehicles, policymakers must appreciate the close linkage between vehicle standards and the resulting technologies and fuels requirements and must assure that the appropriate fuel quality will be available when vehicle standards are introduced.